You may make a Tandem Jump by calling Central Arkansas Skydiving at 501-354-8888 and scheduling an appointment, which are available every weekend and on some weekdays. The training and jump can be completed in as little as 2 hours but you should budget about 4 hours at the dropzone to allow for inclement weather and other delays. Upon arriving at the DZ and checking in, you will watch a 20 minute videotape briefing followed by a 20 minute training session with your tandem instructor. You will be informed about the main and reserve high performance "square" gliding parachutes, briefed on free-fall procedures, and practice exits from the aircraft. You and your instructor will then board the aircraft for the ride to the jump altitude. Just prior to exit, you will move in front of the instructor and your harness will be attached to his at four points (two at the shoulder and two at the waist). 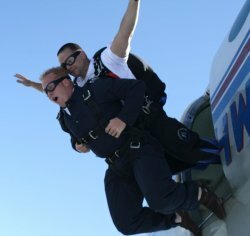 To make a Tandem Jump you must be a least 18 years old (16 with at least one parent present and permission from the other) and weigh no more than 220 lbs. After completion of the tandem jump you will have been exposed to all aspects of skydiving and you can make an intelligent decision whether to take the next step in the training process, the Accelerated Freefall Program ("AFF"). Upon graduation from AFF, the skydiver has all the basic skydiving skills, can make turns in freefall, do back and front flips, move horizontally , hook up with other jumpers, and steer the parachute to a stand-up landing in the target area. AFF Graduates are eligible to continue working on the first skydiving license, the United States Parachute Association "A" License, which takes about 25 jumps to acquire. 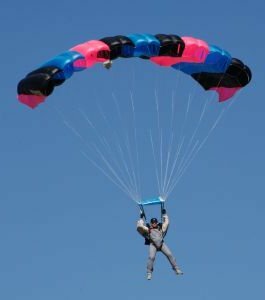 Central Arkansas Skydiving will assist you in acquiring all your skydiving gear at discounted prices. Click on dates in bold for schedule details. Copyright © 2000-2012 - Mike Mullins - All Rights Reserved.